Great moss! Arrived on time and very moist and thick. I highly recommend this product! Definitely worth the money. My grandparents always had a field of this growing in the shade under some large trees and I always wanted some. I purchased a few packages and now it is growing and I love to do as I was when I was a child and go run barefoot on it! I am amazed at how fast this covered a dull, bare area! 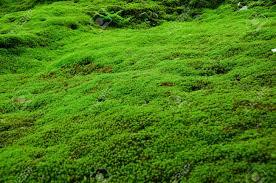 Carpet Moss or Mnium hornum is a lush, green, ground covering plant that resembles carpet. Carpet Moss grows best on decaying wood in moist environments like older sections of woods or shade gardens. This moss is found in the eastern parts of the United States and Europe. It is a brilliant green in color. 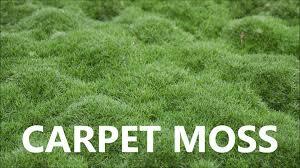 Carpet Moss is known to spread out once it has taken hold in a creeping fashion. It will slowly cover rocks, trees, and the ground which makes it a favorite for landscapers and gardeners alike. It gives a beautiful focal point to any landscape project like stonework or walls. Carpet Moss needs a stable base to grow on. They do well with rich, well-drained, loamy soils and once it is established; can be used to hold the soil in place. Carpet Moss likes moist, shady areas which make them ideal for adding texture in shade gardens. The moss thrives in moisture, and they can double in size in six months with proper care. They are low maintenance, requiring non-sandy soil, shade, and water to thrive. As long as you have the right conditions, you can almost leave it alone, and it'll do just fine. Carpet Moss is a great addition to any landscape. Carpet Moss has been used to create living carpets in flower beds, shade gardens, and yards. It will work its way around flowers and plants that you plant before putting the moss itself down. These mosses are capable of growing year round, even below 32 degrees Fahrenheit. They'll simply go dormant without proper moisture and start growing again as soon as enough consistent moisture gets to the plant. Carpet Mosses are shipped to the consumer in their bare root form, so they arrive in top notch condition.